Most of the topics that we discuss in our blog center around the many different ways that we as caregivers can take care of those around us. 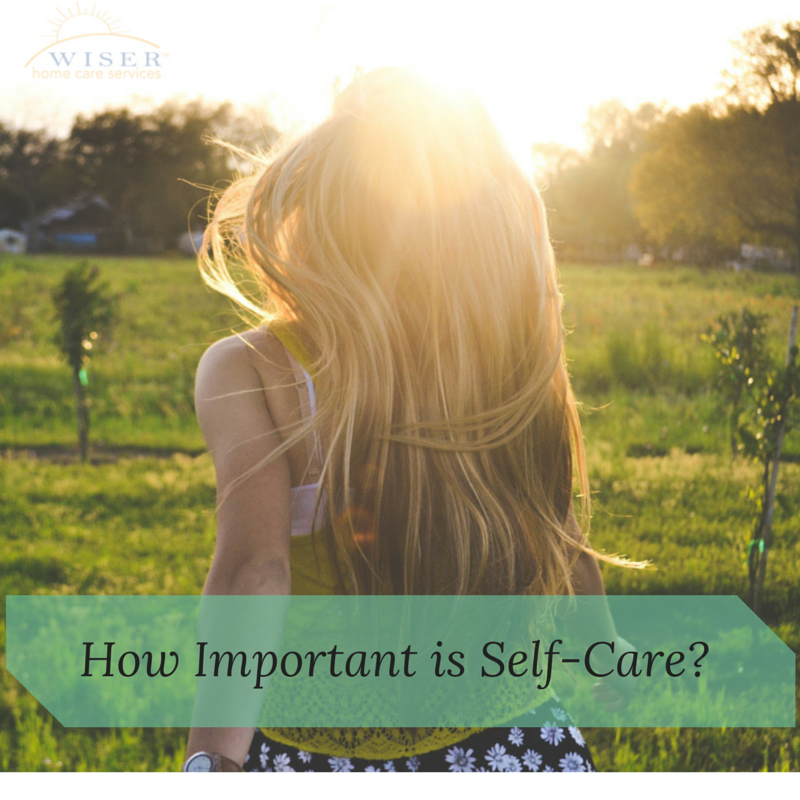 Today, we would like to talk about another aspect of care: Self-care. 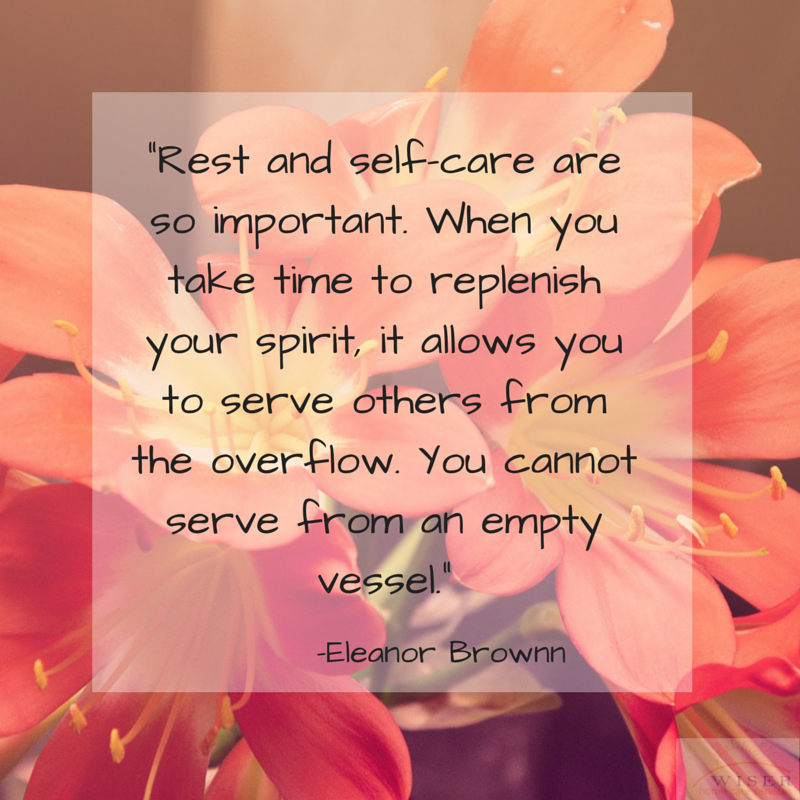 Eleanor Brownn said, “Rest and self-care are so important. When you take time to replenish your spirit, it allows you to serve others from the overflow. You cannot serve from an empty vessel.” We agree with this statement completely. 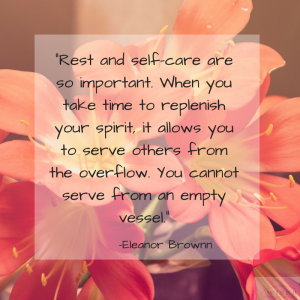 Through this blog we hope to encourage you to regularly re-fill your vessel through self-care. For many who care for others on a regular basis, the act of self-care can be difficult. Consider this, however. Shannon Taylor said, “For those of you who struggle with guilt regarding self-care, answer this question: What greater gift can you give to those you love than your own wholeness?” How can we care for others when we are not whole? The answer is, we can’t, or at least that we can’t as well as we could if we were whole. And, how can we become whole? Through self-care. We truly can care for others better when we learn to care for ourselves first. Because of this we have put together a list of activities that you can do to replenish and care for yourself. Eat healthy food. Cook at home if you can and if you enjoy it. Get enough sleep. Sleep plays a critical role in managing stress and in staying healthy. Make sure you are getting at least 7 hours of sleep every night. Exercise regularly. Walking, dancing, yoga, whatever it is, do it daily if you can. Manage Stress. This goes hand-in-hand with exercise and sleep which can be great tools in helping you manage your stress. Go to regular health check ups. See friends. Go out to coffee and catch up with someone you are close to. Better yet, have a standing date with that person. Do something for your enjoyment. Some good examples could be gardening, watching your favorite show on TV, reading, knitting or crafting. Whatever you like to do, try to fit something in every day. Get a relaxing massage. Pampering yourself every once in a while can make you feel great! Take a bath. Much cheaper than a massage, but with the same great relaxation benefits. Taking care of yourself is just as important as caring for those around you. Remember you can’t meet another person’s needs if your own needs are not being met. As always, if you need help caring for someone you love, we would love to help.